With the popularity of poker these days this might be a successful seller at shows. 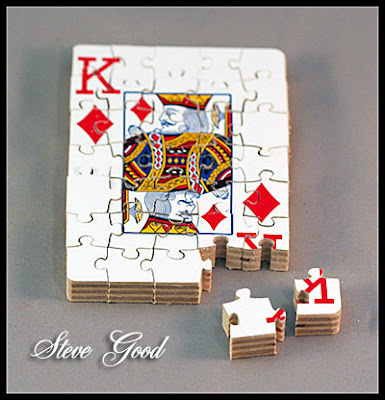 This scroll saw pattern is 2 1/2" x 3 1/2" which is the size of poker size playing cards. For this project I selected a playing card and used spray adhesive to mount it to a 3/8" piece of baltic birch ply. Then I mounted the pattern to a 1/8" piece of ply. I used clear box tape to wrap the two pieces of ply together. I then cut the pattern with the smallest blade I have. 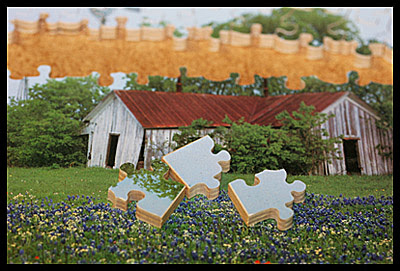 If you have never cut puzzles before watch the jigsaw puzzle video I posted earlier in the blog for details. I hope you guys like these puzzle patterns I have been posting. It's been a while since I have made jigsaw puzzles and I had forgotten how much fun they are. 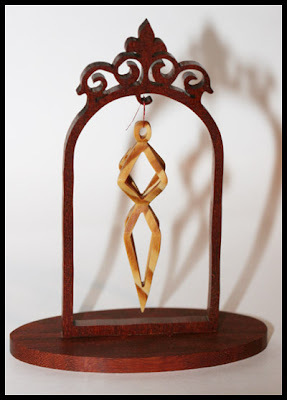 This scroll saw pattern stands about 7" tall. I did something I have never done before. I cut it from 3/4" MDF. I thought I would experiment a little. I might try painting the puzzle and see how that looks. The MDF cut very well and there was almost no need to sand afterwards. I think I will make a few more of these with different animals. They are very easy to cut and fast to make. The retirement community where my mother lives is having a yard/craft sale in a couple weeks. I think she could sell some of these for the grandchildren that always visit there. I wanted to make another Corel Draw video. This time I will discuss moving and positioning objects on the screen. To keep patterns accurate and well balanced you need to be able to move things around the page accurately. I will discuss the align and distribute tools as well as using temporary guidelines for accuracy. I still have several readers asking for more Corel Draw tutorials. 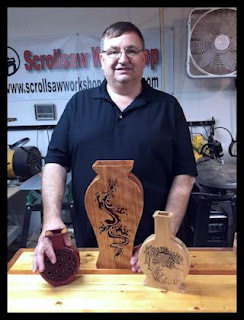 I know not everyone cares about designing their own scroll saw patterns but that's part of why I started this blog. For those of you looking for patterns that's fine also. I'll be posting more patterns soon. The way I look at it the more people that have the skill to design patterns the more patterns that will be out there for us to cut. If you have designed a pattern that you would like to share with the readers here send it to me and I'll post it. I will only post patterns that the readers are free to cut and sell as many as they like. You will still own the rights to the pattern. Hope you enjoy the tutorial video. Not much to see from the top so here is the underside of this shelf pattern. 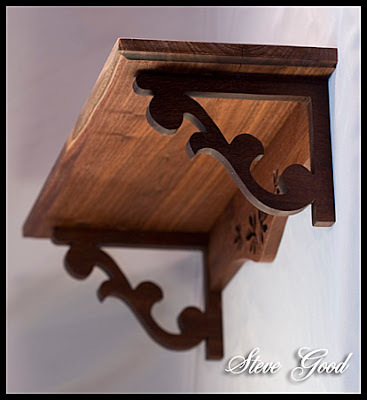 Simple scrolled brackets, leaf pattern under the shelf and a 6" deep shelf. The pattern is designed so you can adjust the length of the shelf. The one in the picture is 16" long. You could take this up to about 30" before the proportions would start to look odd. I used 1/2" walnut for this shelf. I also used a cove bit on my router to under cut the shelf on the front and sides. I love working with walnut. It cuts great, finishes well and is not too expensive. That's a pretty good combination. 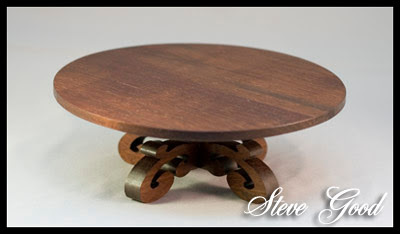 This scrolled pedestal has a 7" top and sits about 2 1/2" high. 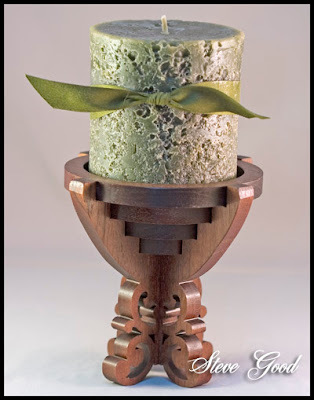 It could hold a center piece for your table, candle, figurine or flower pot. I used 1/2" walnut for this piece. Once you have your wood prepared you can cut this pattern in minutes. There are no interior cuts that need to be drilled. You do want to cut the circular top very accurately. Any defects in the top will be noticed by the eye. Cut slow and you should be able to sand out any defects. This free scroll saw pattern has three plates. 8", 6" and 4" patterns are included. 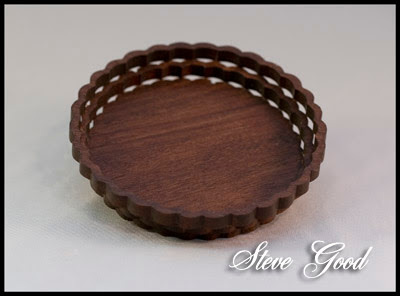 The 4" pattern is great for coasters. You want to cut carefully on the small plate. You don't have much glue surface so don't cut it away. You might also consider using super glue if you have trouble with regular wood glue. I know this is a very simple pattern but it has so many uses I thought I would post it. I was sitting in front of my computer tonight trying to come up with a new pattern. Some nights the creative juices flow easier than others. I noticed an email had arrived. It was a reader suggesting I make a bud vase that matched the Candle Stick Holder and Table Clock patterns from this weekend. Good idea. Here it is. The glass bud vase should be easy to locate. I purchased mine at Michaels Arts and Crafts store for $1.99. The glass vase is made by Libbey. 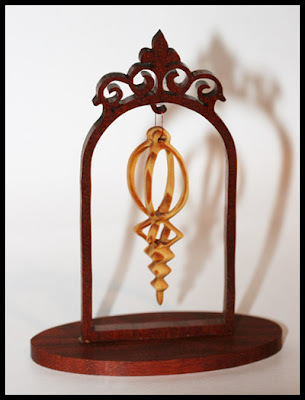 It is 7 1/2" tall and 1 3/4" in diameter. Some simple pattern modification would make larger or smaller glass vases fit. 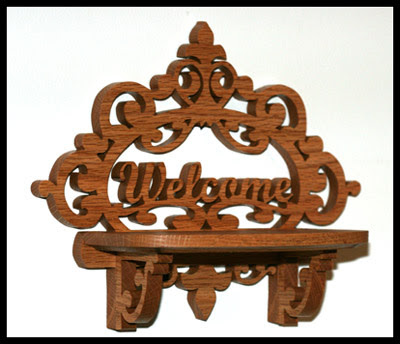 This free scroll saw pattern stand 8" tall. I used walnut for the cross and base. The figure of Jesus is cherry. If any of you have suggestions for patterns please feel free to send them to me. I can't always use the idea right away but I keep them around and work on them as I get the time. 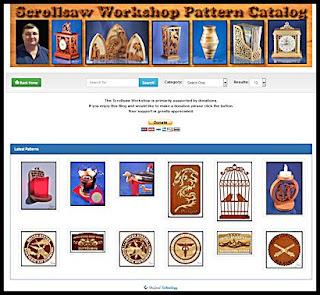 All of the patterns posted here at the Scrollsaw Workshop are designed for the site. You can use the patterns to make and sell as many of the projects as you like. Please don't sell the patterns. I retain all rights to the patterns. This scrolled cup could be used for several things. I put this large round candle in mine. Use your imagination to come up with what looks good to you. The cup stands 5 1/4" high and has a mouth opening of 4". I cut this pattern out of walnut. My wife claimed this project. That's a good sign because she only likes about 1 out of 5 things I design :). 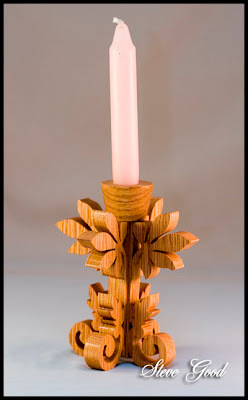 Here is a scroll saw pattern of a Candle Stick Holder that matches the Table Clock in the last post. 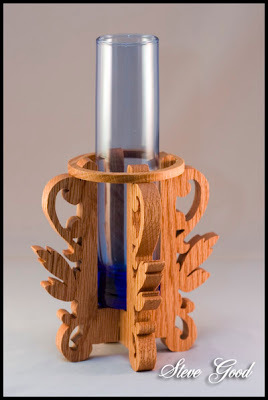 Cut the Table Clock and two of these Candle Stick Holders and you will have a nice set. The holder stands 5 1/4" high. It is cut from 1/2" wood. This pattern is even easier to cut than the Table Clock. Have fun with these patterns. This table clock stands about 10" high. It requires a 3 1/2" clock insert. The hole for the insert is 3 1/4". 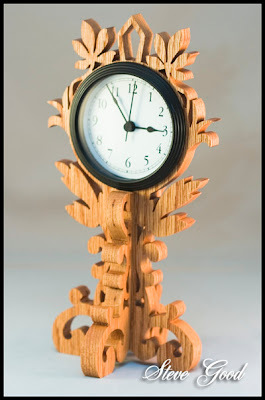 The clock frame is cut from 1/2" wood. This scroll saw pattern is very easy to cut. There are very few interior cuts. Give this one a try. Clockparts.com still has the insert shown in the picture for $3. These are decent inserts for the price. 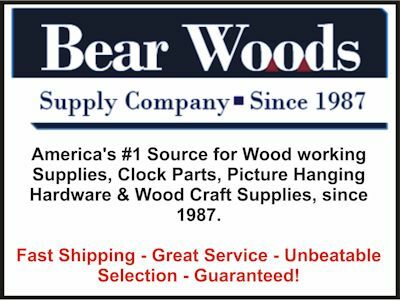 Click the link below to visit Clock Parts. I also noticed that the bezel of the clock is easily removable. This allows it to be painted a different color with plastic paint. I'm going to give this a try tomorrow. I'll let you know how it goes. I wanted to talk about the Jigsaw pattern book that is for sale on my blog. I am experimenting with this concept to try to make a little money for blog upkeep. 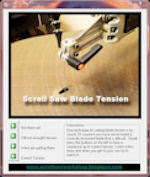 This will in no way change the free patterns that I post here on the Scrollsaw Workshop. 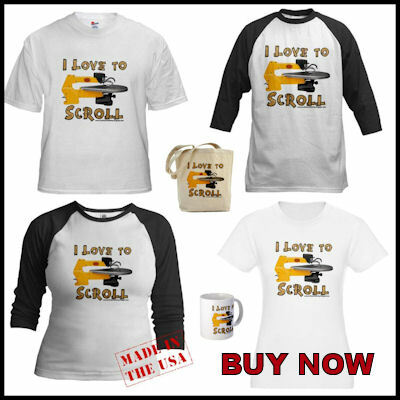 The primary aim of my blog is to share my patterns with anyone who wants them and make money with advertising. I will continue to post free patterns and videos. The donations I receive are great and I appreciate them very much. The Jigsaw Pattern Book just allows me to sell something that I think many scroll sawyers want. Thank you for spending time here at the Scrollsaw Workshop. I appreciate each and everyone of you. I keep getting requests for more ornaments. 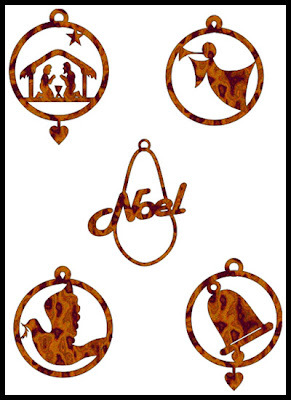 This scroll saw pattern book contains 6 Mini 3D ornaments with stand. 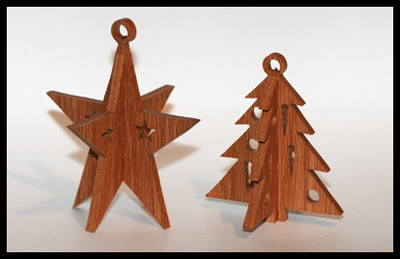 There are also 3 slot cut ornaments for you to make. If you have not cut 3D scroll saw patterns before go look for earlier posts on the blog for details and a jig for making the cuts easier. Hope everyone has a great weekend. The weather here in Kentucky looks fantastic right now. I hope to spend time in my workshop this weekend. Temperatures will be in the 70's tomorrow. After such a hot period I am looking forward having a cooler workshop. 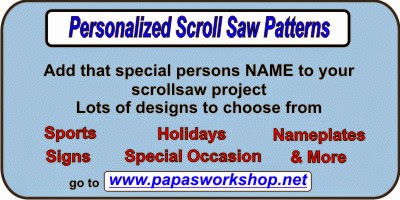 Free Scroll Saw Pattern DownloadPlease consider a donation. Thank you. 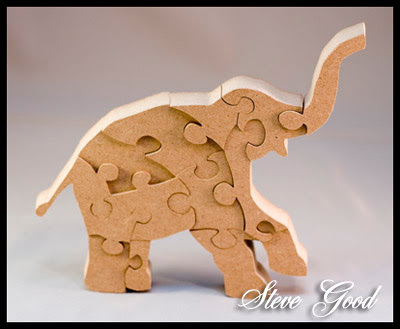 In this video I demonstrate how I make jigsaw puzzles with the scroll saw. I had technical difficulties with the video camera so the editing of the video is a little rough but the information is there. I talk about freehand cutting of puzzles as well as using a pattern to make the puzzle much easier to cut. 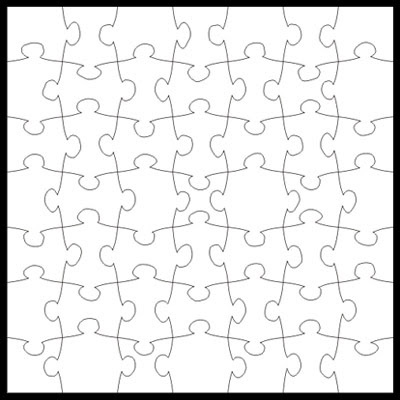 The puzzle pattern will be at the end of this post. 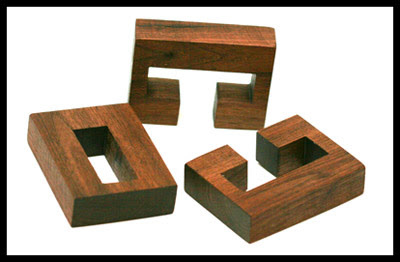 You want to make sure you use a high quality void free plywood for your puzzles. 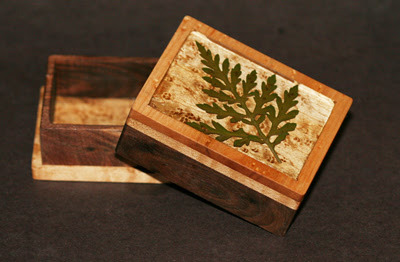 Check out Sloans Woodshop in the links section for a nice selection. This scroll saw pattern is 9" wide and 6" high. The clock insert is optional. You can just cut the hole and it will be the moon. It's difficult to see in the picture but each element is 1/4" thich and sits in front of the layer behind it giving a 3d look. There is enough room on the base to sit a candle if you like. The candle high lites the 3d effect by casting flickering shadows. Using different species of wood gives the project a great look. In this example I used Walnut for the sky and base. 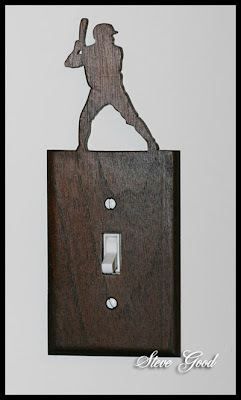 The cowboy is Peruvian walnut. The cactus is Yellow heart and the dog is Bubinga. The mountains are Maple. I designed this tilting vanity mirror to show how I use clip art to create scroll saw projects. The movie below will show the design process. This technique makes it much faster to design scroll saw patterns. The project requires a 5" round mirror. I use two 1/2' brass screws for the pivots. Make sure you drill the countersunk holes for the pivoting screws before you cut the leafs pattern. Counter sink the screw hole deep enough so about 1/8" of the screw sticks out the hole. Cut the pivot tabs on the outer frame long and sand to snugly fit the mirror frame. Make sure that when you tighten the brass screws the mirror will pivot and stay in position. 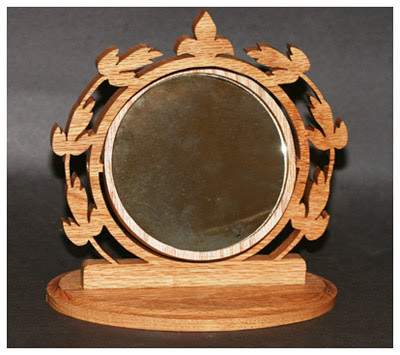 As you tighten the screws the outer frame will put pressure on the mirror to keep it tight. Time to start cutting ornaments! Well it won't be long before the Christmas season is here again. 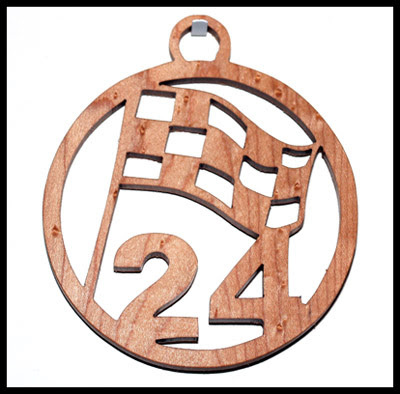 Christmas ornaments are probably the most popular scroll saw projects. I have put together a small collection of ornaments for you to start getting ready for the holidays. I usually use 1/4" wood and stack cut two or three at a time. One of the readers of The Scrollsaw Workshop left this message. If you are interested email me your email address and I'll send it to Steve so he can contact you about the details. 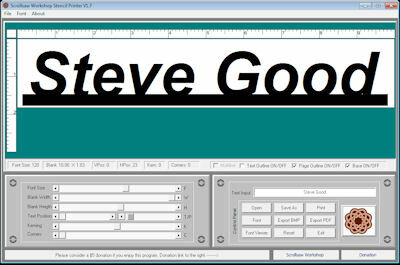 Steve, I have an old version of Corel draw (rev 3) if you know anyone who is interested. 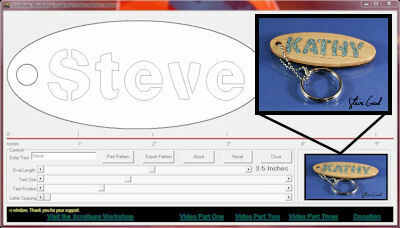 Here is a free scroll saw pattern that is easy to cut and lots of fun to play with. 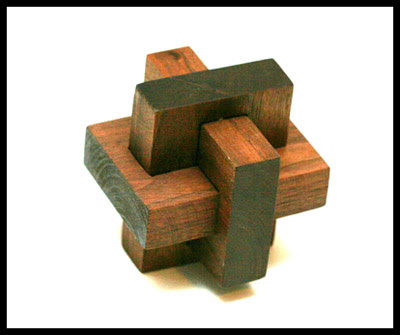 The Wooden Knot Puzzle is surprisingly difficult to assemble. I can't take credit for the design. 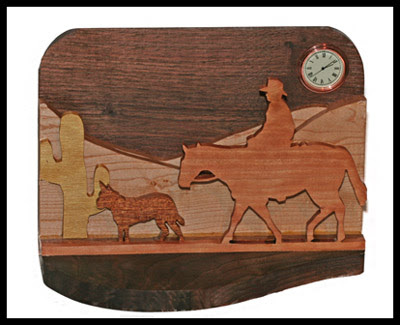 I saw this puzzle on the Woodwright's Shop show. He cut everything with hand tools. I thought it would make a neat scroll saw pattern. I put a short video together showing how to assemble the puzzle. Check it out below and have fun with it. 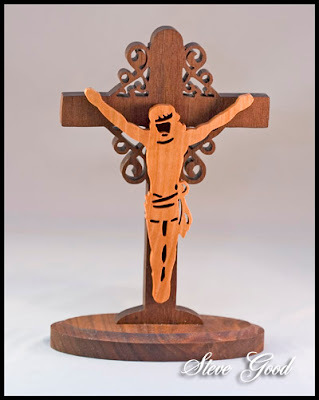 Here is a unique project for your scroll saw. This small box has a recess that is about 1/4" deep. 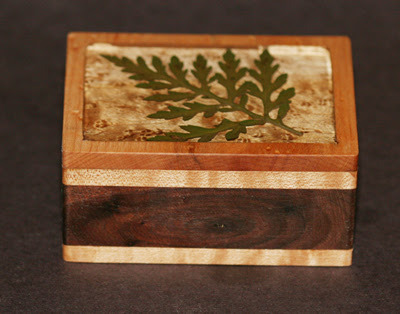 You can place small objects in the cavity and fill it with Clear Casting Resin. Coins, stamps, concert tickets, flowers anything you want to preserve and enjoy. The box is a typical scroll saw box. The addition of the extra piece on top is where it becomes unique. You can make it 1/4" to 1/2" deep depending on the size of your object. Important note, you need to set your scroll saw table to about 3 to 4 degrees when you cut the top frame. I Learned the hard way that the resin will warp slightly as it dries. If you under cut it will keep the resin from lifting. To get the best result follow the directions that come with the resin. Most objects look best if you pour some resin in the cavity then let it dry for about 30 minutes. Then insert the object and finish filling the cavity with resin. This makes your object look like it's floating. After you pour the resin pour the left over in a container. 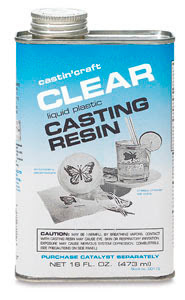 Use this extra resin to check for dryness. If you touch your piece too early you will leave a finger print. It took about 3 days before my piece complete cured with no tackyness. Make sure you don't practice the casting process with anything valuable. If things go wrong it is very difficult to get the object out of the resin. Here is a simple pattern for you to cut. 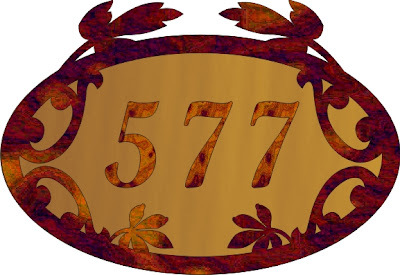 This house number plaque would make a nice gift. You could use contrasting woods or paint the backer board. You want to make sure the numbers stand out from the backer board so it is more easily seen from the street. The plaque can hold a maximum of four numbers. If you need more numbers You should increase the size of the plaque. If you shrink the numbers they will become too hard to see. 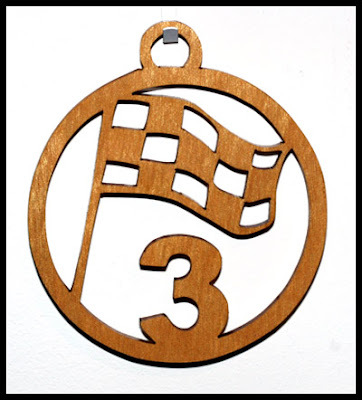 Wade, one of the readers of the Scrollsaw Workshop has had good luck selling the race trophies posted earlier. He requested that I make the pattern into ornaments. Here they are. 01-99. 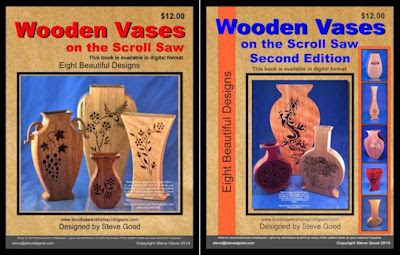 If you are selling your scroll saw work at arts and crafts shows it's always good to have some lower priced items to sell. Ornaments fit the bill perfectly. You can stack cut these from 1/4" wood to speed up the cutting. Thanks Wade I hope these work out well for you. Keep us posted. This shelf is 10" wide and 8" high. I used 1/2" red oak to cut this pattern. To hang the unit drill two countersunk holes just below the shelf. You can plug the holes after inserting the screws in the wall. It's a beautiful day in Kentucky, 82 degrees and sunny. My shop is comfortable for the first time in weeks. I hope to spend the rest of the day cleaning the shop. Here in America we celebrate Labor Day this Monday. An extra day to play in the shop! To all you scrollers in the states have a happy holiday.